Reach Truck Attachments - Reach Trucks are industrial equipment used for loading and storage in some businesses that maintain storage of supplies to finished commodities on a pallet which are then inserted into lofty shelving units. This loading device helps companies securely and effortlessly stockpile and retrieve loaded pallets at the same time as ensuring sufficient storage of merchandise that are not immediately necessary. Normal reach trucks are built with a mounted rigging mechanism on the front of the vehicle. Telescoping forks are able to travel up and down on this mounted rigging. A system using hydraulics permits the operator pick up and even reposition the freight over the outriggers. This design provides a more even balance of the weight and allows for simpler maneuvering amid the stockroom shelves and small aisles. After arriving at the specific shelves intended for the pallet, the hydraulics permit the forks to swing and slide the pallet into place. A reach vehicle will usually fit into an aisle less than 10 feet across without any issue so long as there are no hindrances protruding from the shelving. 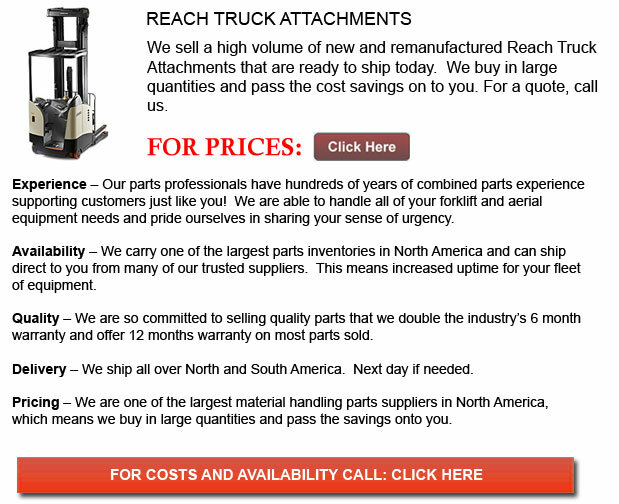 There are many distinctive styles of reach truck on the market. The simplest unit is a stand up model that you can slide the forks underneath the pallet and then transfer it to an alternate location for storage, then slide it into place. Commonly this design of reach truck is beneficial for shelving units that are only one pallet deep. A double-reach vehicle works in the same basic way as the stand-up type but uses telescopic forks that are long enough to slide a pallet into shelves that accommodate two pallets. Straddle reaches are a different reach truck variation. This mode of reach truck slides beneath the pallet and is also able to seize the sides as well. The straddle reach unit is beneficial when grasping the sides of the pallet and commodities will not result in breakage. They permit straightforward pallet retrieval of a pallet that may be 4th or 5th in line and are helpful when the shelving units are accessible in more than one direction. Warehouses, production plants and material firms repeatedly use a number of types of the reach truck. Utilizing a reach truck to store supplies, pallets of finished goods, and in general to keep the storage area in order is a common practice. Easy to operate, the reach truck can help make better use of both time and available stockroom space.